I've never made a stollen before. And like many people unfamiliar with the actual baked good, I had assumed it was a dry crumbly yeast rendition of a fruitcake. Well let me tell you, no bread with this amount of butter and other enrichments could ever turn out dry unless you doubled the flour and baked it black. My pastry cloth was practically transparent with butter oil by the time I was done rolling and shaping. Not that butter is a bad thing... ☺ I'd say this über rich pseudo-pastry is like a cross between a danish, a fruitcake and a croissant. 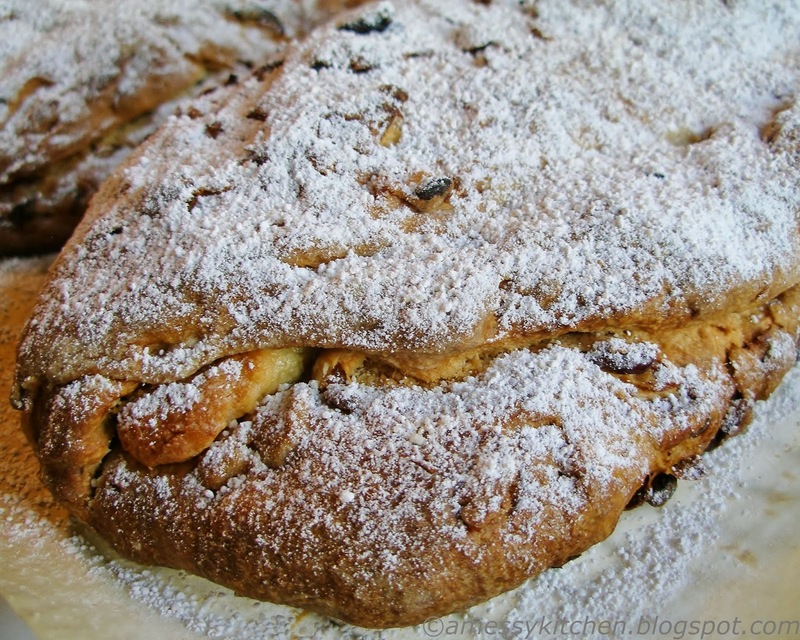 I did add the almond filling that is often seen in stollen, even though it was not in the original challenge recipe. 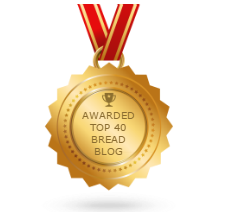 (Congratulations by the way to Susan of Wild Yeast, the host kitchen, on her marriage this month!) I think maybe next time I won't need to add the filling, this was so rich and delicious anyway. And easier to make wonderful toast out of it without the filling oozing out as it warms... Mmmmmm. We'll see. If you want to try it out, here is the recipe as presented for the Buddy challenge. This post will go up for Yeastspotting! The stollen I'd had before was dry, that was stollen as I knew it. This is not that one you are so right. This stollen I'll make again. ;-) lots of butter, not dry, yum good. Love to have you bake with us. Hope these are merry and bright days for you and those you love. Beautiful! I'm so happy to have you baking with us this month. Happy New Year! I'm so glad your Stollen turned out well! A beautiful stollen Kelly! It does make great toast, but the melty filling when warmed does sound delicious, too. Happy New Year! Oh wow now that's a mouthwatering description; oozing out warm filling!